A CIO of a manufacturing firm has a mandate to replace the company’s legacy on-premise ERP system to cut rising costs without sacrificing functionality. 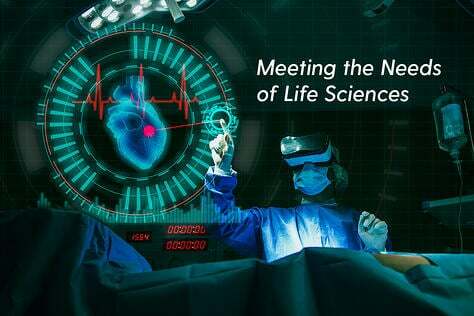 An executive at another manufacturer looks at cloud-based ERP solutions to see how they might drive his company’s digital future. The CIO at a third company wonders if he can somehow implement a cloud solution without giving up his company’s investment in their on-premise ERP system. These aren’t imaginary scenarios. 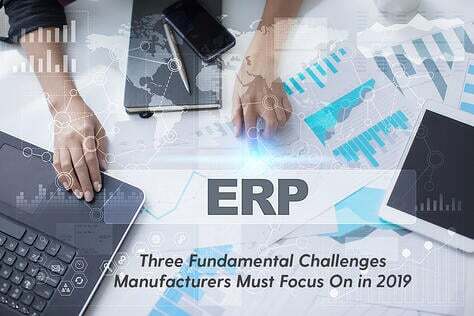 They are part of the ongoing debate about which ERP solution is ideal for manufacturers and distributors. Do you move to cloud-based ERP, stick with your legacy on-premise ERP, or try to implement some hybrid solution that incorporates both technologies? It’s not a new debate; companies have been trying to resolve this question for several years now. Markets today are driven by rapidly evolving digital technology and increasingly savvy customers. Manufacturers need a flexible and scalable ERP solution that delivers streamlined processes, increased efficiency and productivity, enhanced customer service and, of course, lower costs. On-premise ERP systems have been around for several decades (hence the name “legacy”), and have delivered benefits to large organizations, but at the price of increasingly expensive updates, maintenance and customization. Cloud ERP systems deliver these same benefits and more, but at lower costs and with greater ease of use. Some companies, unwilling to abandon their enormous investments in on-premise ERP, have implemented hybrid solutions that combine new Cloud ERP functionality on top of their existing legacy system. The primary differences between cloud-based ERP and on-premise ERP is where they are installed and how they are priced. On-premise ERP systems are installed on servers and networks maintained on site by the manufacturer and its IT department. Customizations typically require specialized resources and are famously time-consuming and expensive. Upgrades often undo previous customizations. Cloud ERP is Software-as-a-Service (SaaS), so it’s installed and maintained on the vendor’s servers without the need for expensive hardware, and users access the software in a web browser. Cloud ERP upgrades are continual, automatic and take advantage of the cloud platform’s technology to deliver cutting-edge analytics and support for IoT. This a major advantage of multi-tenant SaaS applications vs legacy systems that are hosted in data centers, but often marketed as “SaaS” or “Cloud.” Multi-tenant cloud applications upgrade easily over time, whereas legacy systems and hosted legacy systems are prone to remaining on old versions because they are so difficult to upgrade. 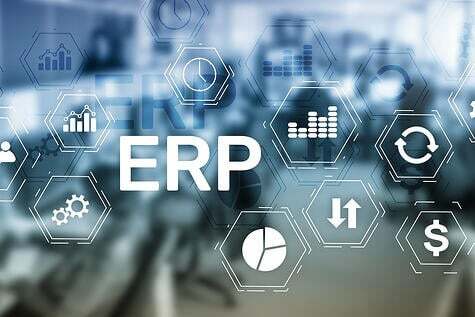 Cloud-based ERP solutions also integrate more easily with other applications, especially those that are on the same platform, without the expense and pain often associated with legacy ERP systems. On-premise ERP is priced under a one-time perpetual license fee, usually based on the size of the organization or the number of concurrent users. Cloud ERP pricing is based on a monthly or annual subscription. This difference in pricing models means that Cloud ERP has a much lower upfront cost than on-premise ERP. Hybrid ERP systems combine on-premise ERP systems with cloud-based software. Companies that choose this solution run business-critical functions in their own data centers under their own control, often in a private cloud. The cloud-based software gives end users access to other applications or components from public clouds. Hybrid solutions may help reduce IT costs and implementation timeframes, but their most attractive feature is the fact that companies may be able to keep much of their existing on-premise software while taking advantage of modern hosting facilities and access over the internet. It’s becoming clear that Cloud ERP is here to stay, whether available as SaaS in a public cloud or SaaS added to on-premise systems as part of a hybrid solution. Indeed, Gartner has found that while large manufacturers still rely on their on-premise systems, they predict that in two years 35% of new ERP deployments in larger firms will be SaaS, including hybrid solutions. Gartner also found that some larger companies are beginning to turn to Cloud ERP solutions for specialized business units to create multi-level support. Small-to-medium sized firms tend to have less complex business requirements and see cloud-based ERP software as a long-term, flexible solution to run their entire businesses. It is easier for these organizations to replace their entire set of applications compared to large companies that have difficulty extracting and replacing the monolithic ERP systems they have spent so many years customizing. Gartner identifies several benefits of Cloud ERP: it’s scalable, flexible, gives users real-time resources, it’s more customer-centric, and up-front costs are lower. In spite of these benefits, Gartner still predicts that by 2020, less than 5% of operational ERP deployments will be through public cloud SaaS. Much of the reluctance to move to Cloud ERP can be found in those large companies with complex on-premise systems. 41% of enterprise workloads will be run on public cloud platforms by 2020. An additional 20% will be private cloud-based. Another 22% will be running on hybrid cloud platforms by 2020. 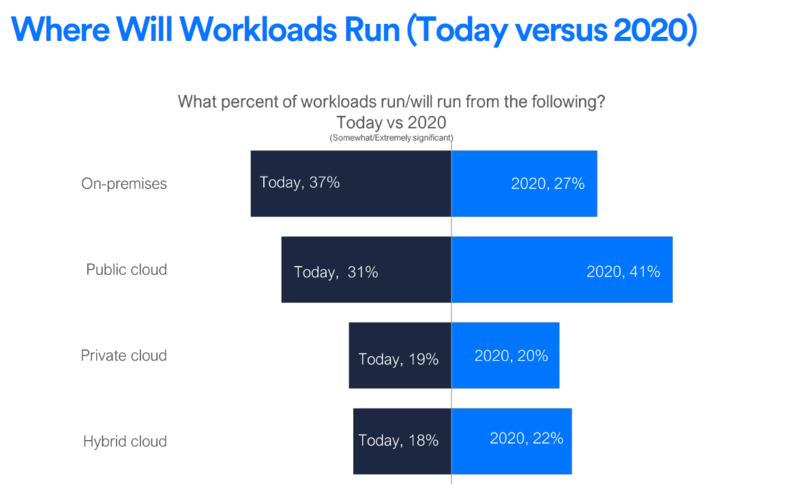 On-premise workloads will shrink from 37% today to 27% of all workloads by 2020. How does Cloud ERP and on-premise stack up against each other? The table below illustrates the differences. Deployment Hosted on the vendor’s servers and accessed through a Web browser. There are no high operating costs related to hardware purchases and maintenance. Installed locally on a company’s own computers and servers. Lower upfront investment and predictable costs over time. No additional investments in hardware such as physical servers. The vendor handles backups, resulting in less costly downtime and server failures. Recurring fees for training, support, and updates. High operating costs from outdated software and hardware. Pricing Subscription-based pricing. One-time perpetual license fee usually based on the size of the organization or the number of concurrent users. Implementation Short implementation times. The average Cloud ERP solution takes 4 to 8 months to implement, which means firms can realize a much faster return on their investment. Implementation is time-consuming and expensive. Implementation can take as long as 36 months. Security The software vendor handles data security, but the firms’ IT groups work with the vendor to ensure the highest level of security. When hosted on an established, secure cloud platform like Salesforce, Cloud ERP software takes advantage of the platform’s many security features. Cloud platform companies can also employ larger security staffs with specialized security skills, compared to most companies doing it themselves. Historically considered very secure because hardware and software are installed locally. Access can be more closely monitored and controlled. However, the need to constantly patch these systems together with updates and customizations may introduce security risks. Continual updates from the vendor mean fewer time-consuming and expensive customizations. Cloud ERP software on modern cloud platforms like Salesforce can easily add customization through out-of-the-box integration with other products. Historically considered more customizable than cloud-based ERP systems, but customizations come at a steep price. Customizations often require specialized skill in old ERP software and time-consuming configuration, using up IT resources and causing system downtime. It is increasingly more difficult finding resources familiar with the older ERP systems. Your legacy software may be so old that the original vendor has gone out of business. The original software vendor may have been acquired by another company that no longer supports your ERP system. Your IT specialist, who did much of the customization, left the company; the new specialist doesn’t know about all the previous customizations. Many companies using legacy ERP applications remain in limbo on old releases because the upgrade process is too painful and expensive. Mobile Cloud-based ERP software is mobile-ready, giving employees the ability to communicate and resolve issues immediately from anywhere. Mobile support is natural and upgrades in sync with the system. Mobile accessibility can pose an issue for on-premise deployments. It often requires an entirely new application to be built on top of the old user interface, which needs to be continually maintained in coordination with the new package. For many companies, this undertaking is simply unrealistic. 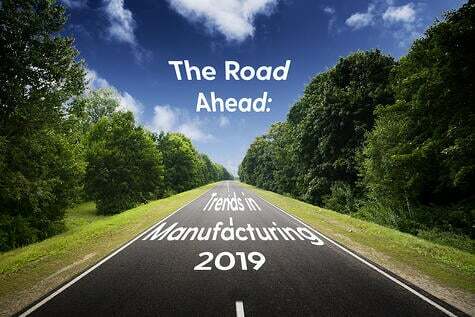 In spite of the ongoing debate among manufacturers, those companies that have moved to the cloud have had real success. For example, The Pacer Group, a wire and cable manufacturer specializing in engineering, was spending more and more on annual hardware and software upgrades for their legacy on-premise system. 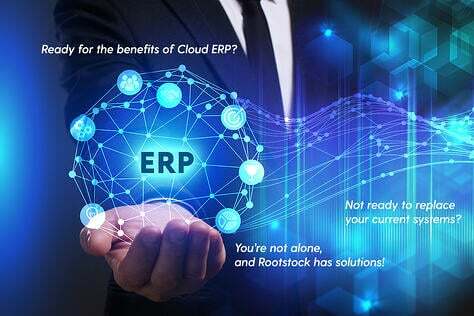 After switching to Rootstock Cloud ERP, they enjoyed easier updates, increased connectivity through multiple devices, reduced man-hours and better customer service. “We’re running more smoothly and with less frustration,” reported John Swiatkowski, President of The Pacer Group. 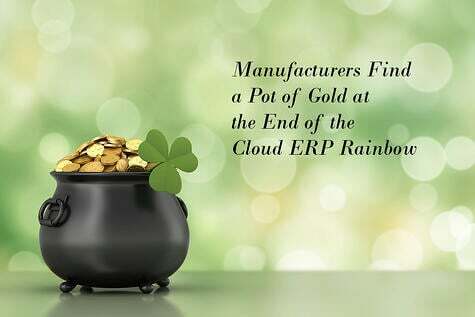 It’s clear that manufacturers and distributors already know the value of Cloud ERP. 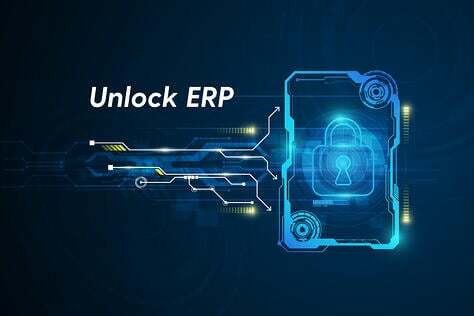 Even large manufacturers, reluctant to completely abandon their investments in legacy on-premise ERP systems, are looking for ways to implement cloud-based functionality via hybrid ERP solutions. 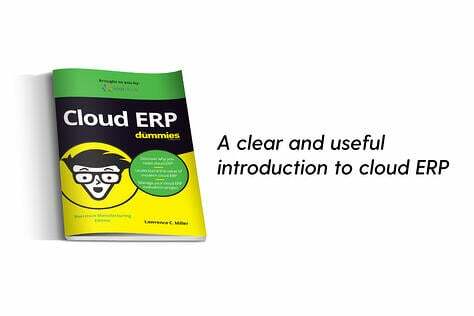 Cloud ERP is clearly the present AND the future of ERP.